Joel Morrison is a Los Angeles-based sculptor, born in Seattle, Washington in 1976. He is best known for his composite sculptures, which are often constructed from found objects, cast in fiberglass or high-polish stainless steel. He studied and received a BA in English Literature at Central Washington University, and an MFA in sculpture at the Claremont Graduate University in Claremont, California. Morrison’s sculpture draws upon art historical reference and popular culture. Pairing quotations from various genres of art with common items and detritus, like plastic bottles, weather balloons, plaster busts, shopping carts, light bulbs and bubble wrap, he reorients objects from everyday life by integrating them into themes of Pop, Surrealism, and Classicism. Morrison uses a myriad of technical processes to create cast stainless steel sculptures with bright, high polished surfaces, reflecting the object’s surroundings. He demonstrates his technical ability to manipulate and harmonize these chosen objects – neck braces, wasp nests and bullets – juxtaposing various genres and creating sculptures that range from neo-classical Greek busts to grotesque, amorphous forms. They form a reinvented dystopia, where mundane objects are glorified and classified. One constant in Morrison’s body of work is a dynamic exchange between his own brand of humor and the canonized body of art history. Joel’s sculpture New Madrid from 2012, displays a wall hanging tableau covered with a cargo blanket, with stitched pattern which mimics the geometric shapes from Frank Stella’s famous monolithic work Getty Tomb, from 1959. Morrison’s hint at obscured canvas holds limitless possibility. Abstracting all that it reflects, the facade envelops the color and shape from the world in real time in its ever-changing surface. Morrison’s work has been exhibited internationally and is included in numerous public and private collections worldwide. In 2006, he was a featured artist in the California Biennial held at the Orange County Museum of Art, as well as a participant in the critically acclaimed Thing exhibition at the Hammer Museum, Los Angeles. In 2010, Morrison was featured in Six Solos at the Wexner Center for the Arts. His numerous other group and solo exhibitions have been at venues throughout the world, including the Kolbe Museum and Haus Am Waldsee Museum, Berlin, and Santa Monica Museum of Art. 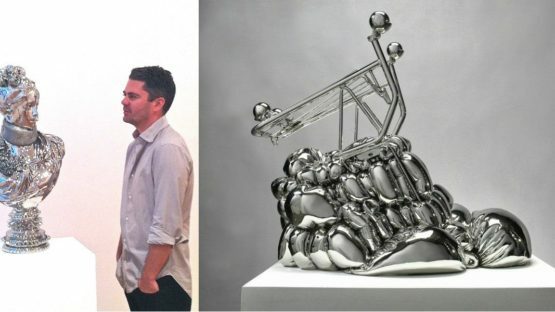 Gagosian Gallery has held solo exhibitions of Morrison’s work in Beverly Hills in 2008, New York at Madison Avenue in 2011, and Hong Kong in 2012. Morrison is currently living and working in Los Angeles, CA.